Title : From Apple Trees to Cider, Please! I was a bit disappointed in From Apple Trees to Cider, Please!. It's not a bad book by any means but I think it suffered from the rhyme scheme as it didn't allow enough scope for fully explaining the process involved in making cider when it came to the machinery aspect. It was challenging for text and illustrations to fully represent, for example, how the apples are squeezed to make the juice come out. The illustrations, while conveying all of the fun and colorful activities at an apple orchard open for the season, were a bit busy and cartoon-ish for my taste. That said, my son seemed to enjoy it and asked for several readings. Talk about lack of diversity. Every single person is the same shade of beige. Every single woman and girl is wearing a dress. And only men, not women, are depicted operating machinery or really doing any work at all. Really enjoy reading this with my kids every season. We always read it before visiting the orchard and this year was no different. I found that my oldest was more interested in the process this year and more engaged in the illustrations. He even asked to see a video on the cider making process. A great book just in time for fall! The mother and daughter go to the orchard to see the apples grow and learn how cider is made. Then, (surprise!) there's an apple festival where they can taste other yummy apple treats. It was sort of a "How it's Made" for preschoolers. Perfect for an apple story time. An excellent story to get you in the mood for apple picking! Told in rhyming text format, this story shows children the apples’ journey from growing on trees until they are made into apple cider. The illustrations are cute and colourful and go perfectly with the story. Who knew what it took to make apple cider? This book will walk children through the apple cider making process from the orchard to the enjoying a cool glass of cider and everything in between. We've been reading this since the fall (after several trips to the pumpkin farm). Cute story of the process of making apple cider and featuring many things you can find at an apple orchard/farm. It is a pretty fall day and just great for apple picking and making apple cider. The reader follows along with a family as they pick apples straight through to the process of making apple cider. 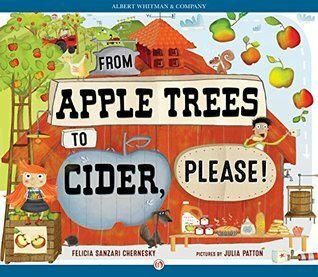 With rhyming text, it makes a great read- aloud story teaching others about the process of apple cider making on a juvenile level. I would recommend this title for a read aloud for storytime as well as for anyone interested in the basic concept of picking apples and making apple cider. The story is easy to follow along and the illustrations are colorful and a little quirky and the characters are depicted as happy and carefree. From Apple Trees to Cider, Please! follows a little girl and her mother as they go to the apple orchard. As they journey through the orchard they follow the process of and apple becoming apple cider. It's a wonderful journey filled with a delightfully rhyming text and the colorful illustrations of Julia Patton. This book would be a great read before taking your own children to the apple orchard, or and excellent addition to a teacher's unit on autumn. The illustration style is really neat - I loved the way the little girl's hair was done. It did get a little bit busy at times, but as a whole, I still liked the pictures.As far as text, I feel like the rhyme gave the story less impact. I found myself skimming over it, because that style of rhyme is usually for much, much younger kids, but the story of making cider is for kiddos who are a little bit older. Every year teachers ask for books that talk about apples and plant cycles. This is a fun rhyming one that even the youngest student will enjoy and understand. The illustrations are very colorful and whimisical. The skin coloring is undeterminate so any child can feel like they look like them. Each two page spread if filled with colors and a simple sentence or two. The illustrations include labels and signs that help children understand the process. I would recommend this book. I guess children's books with rhyme schemes such as this are why modern poets tend to avoid rhyme altogether. It never really annoyed me until I started reading children's books with regularity for work. Everything else about the book is good. It teaches how to make cider and the art is vivid. It would actually be a good selection for the age group I usually read for (4-7 years old). 3.5 stars. illustrations and the colors are wonderful. we had an Apple Tree while I was growing up. So that brought back memories. the last page made me wish I had a tall cold glass of Apple Cider to drink. Cute!I love the introduction to making apple cider. I will be reading this to struggling readers who will appreciate the rhyming! Good book for my PreK-2 school. In rhyme it shows the process of making apple cider. A perfect little read for apple picking season. Loved the rhyme and illustrations! Any thing about apples is HUGE at my library in the fall so we added this one. It's not my favorite but solid.